If a bitchy prime minister and a crazy president weren’t enough, for the upcoming months the seasonal chart is also indicating further price setbacks. 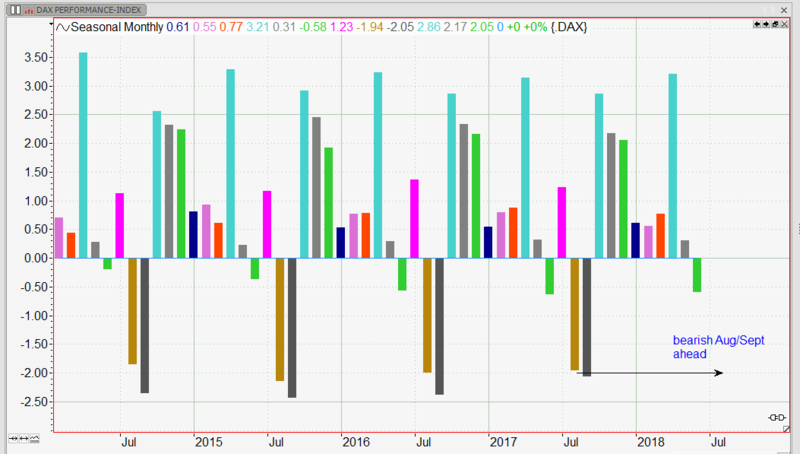 Analyzing the average monthly performance of the German DAX index a distinct pattern of seasonality can be observed. On average June has been down 0.6%, but the big trouble is yet to come. The chart shows the average monthly performance of the DAX index, using data since 1999. Each bar of the histogram represents a specific months percent performance. Starting with the dark blue bar in January, the green bar right now represents the average June performance. As you can see on the above chart June always has had a bearish prognosis over the last years. July might bring some relief (the positive magenta bar behind June), but therefore August and September surely got a strong bearish setup. Although the markets have been bullish over the last 20 years, the average combined performance of August and September is -4%. The average performance of a month is not a good indication for the actual magnitude of the upcoming market move, it just is an indication for its direction. Where the move might go you can see on the market neutral volatility prognosis. 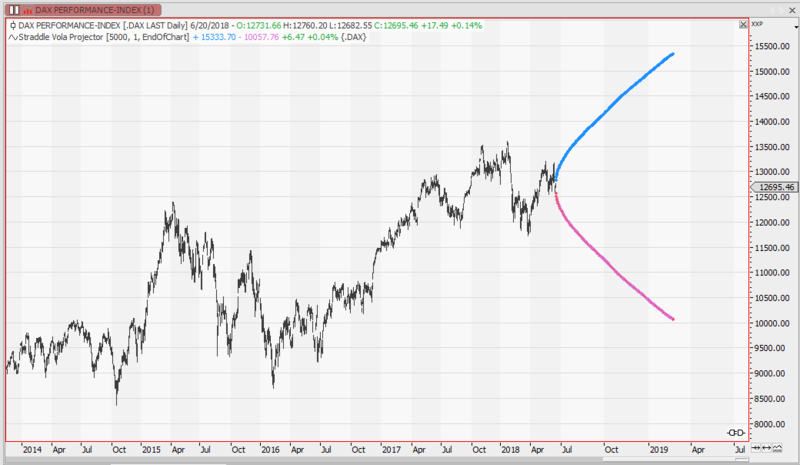 The shown prognosis is based on Kvolatility and uses the DAX returns since 1999 to calculate the average expected move for the next year. Due to reasons I have got some trouble in hoping for a move to the upper boundary of the Kvolatility projection, but I surely will structure my trades to profit from a bearish move within the next few months.